Thanksgiving is a time of family, food, and shopping. It's also a time of getting lost on the way to visit relatives, cleaning up crazy kitchen messes, and dealing with people who would stab you in the back to get a great sale. Fear not: Your Android phone has you covered, with apps that can make this Thanksgiving holiday an enjoyable (or at least a bearable) one. Are you usually the person who has to host Thanksgiving dinner? Isn't it always a frantic mess, trying to plan the whole ordeal? 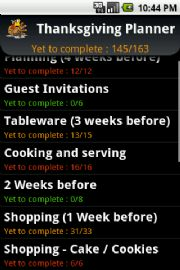 With the Thanksgiving Planner app, you can get better organized and have a less stressful holiday. The application comes preloaded with a checklist of 163 items that will help in breaking down the workload into smaller, more manageable chunks. You can even tailor the list to your own needs by adding or removing events. If you have ever wanted to know how to prepare a turkey and pumpkin pie for Thanksgiving, you might want to check out Holiday Kitchen--Turkey Time. It's more akin to an instructional video than an application, in that it shows you a 5- or 6-minute video that demonstrates how to complete a specific task. In this case the video offers step-by-step instructions on how to prepare, cook, and carve your Thanksgiving Day turkey, as well as how to make your own pumpkin pie from scratch. Thanksgiving Turkey Calls allows your Android phone to make authentic turkey calls--a perfect way to get into the Thanksgiving spirit. You can choose from 12 different warbles, and each call includes a small fact explaining what that gobble means. Use them to entertain yourself and other (bored) family members. Put your phone in a festive mood with the Thanksgiving Wallpapers app. You can choose from 42 different scenes, some featuring beloved Peanuts characters such as Charlie Brown and Snoopy. If you're not a huge Peanuts fan, you have plenty of other wallpapers to browse, including various Thanksgiving motifs like pumpkins, turkeys, and Indian corn, plus other fall images. My HTC Droid Incredible will be sporting turkey wallpaper come this Thanksgiving Day. 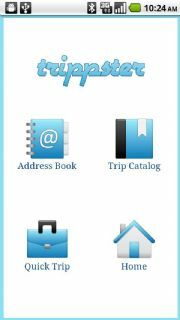 One part contacts list, one part Google Maps, Trippster will help you travel to your holiday destination. The clean and straightforward layout makes importing your contacts and keeping track of your trips easy, giving you quick access to the addresses you navigate to frequently. The trip catalog keeps track of all your outings and gives you the ability to plan for multiple stops; the latter is helpful should you need to pick up a few things or visit certain relatives and friends en route to your final destination. This is a great app to have if you plan on driving to multiple locations this holiday season. Thanksgiving isn't just a time for turkey and stuffing--it's also the day before the infamous Black Friday sales. Luckily you have the Black Friday Survival Guide app installed on your phone to help you move efficiently through the mobs of mad shoppers. The app lists the latest sales as they happen, and lets you browse through sales by store and category. One particularly useful feature: If you find an item you like, the app can tell you how many of that product a store has in stock. So, you can skip the stores with lower inventory and go to a place where you have a greater chance to find the item you're looking for. Let's say you've found the item you want to buy in a store, but you aren't sure if it's the best deal you can get. No problem: Use the ShopSavvy Barcode Scanner to find the best price. Simply scan the bar code of the product you wish to buy (make sure that the phone's camera lens is clean), and ShopSavvy will use your GPS location to find the item in other stores near you, along with their prices. ShopSavvy will also search online and allow you to set alerts for when the product drops below a certain price. Like these? Need apps on other topics? Be sure to check out PCWorld's Android App Guide for more of the latest app reviews and roundups. What are your favorite Android apps (in any category?) Let Armando Rodriguez know. He's PCWorld's Android app specialist.